Wow we love it. Be party ready in this fabulous joes jungle off the shoulder mini dress. A fully lined dress that hugs and contours the body. Made from stretch crepe fabric. Features a back vent & fastens with a concealed side zip. Model is 5ft 8in and wears a Size UK 8. 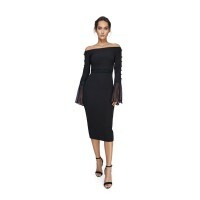 This figure-hugging mini creates a flattering hourglass shape and is accented with feminine ruffles and bell sleeves. Made from a light stretch crepe fabric. Fabric composition: Main 96% polyester 4% elastane. Lining 93% cupro 7% elastane.